The Parkinson's Weighted Kit contains the most popular of our weighted products for tremors; an essential package perfect for your eating and writing needs. 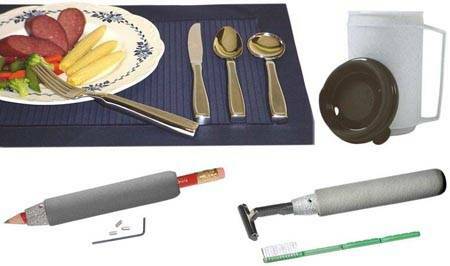 KEatlery Weighted Utensils which were designed to be the most attractive and functional utensils for those afflicted with Parkinson's. Weighted, insulated drinking mug that provides drinkers with the safety and confidence of no longer spilling hot, or cold, beverages. KEatlery Weighted Utensils have a slight indentation which place the fingers in a comfortably ergonomic position. 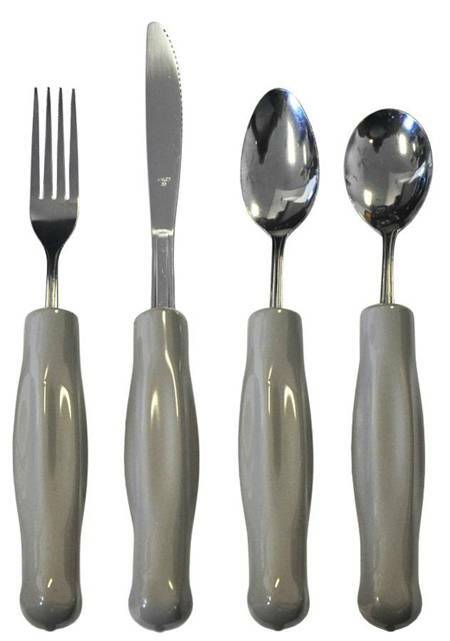 The eating utensil set includes: A tablespoon, a soup spoon, a fork, and a knife. The soup spoon has a recessed edge and a slightly deeper bowl to assist in preventing spilling. Each utensil weighs approximately 7 ounces. The weighted utensils have solid, heavy-duty handles which can stand up to the rigors of an active, engaging life and can also be placed in any dishwasher. They are fabricated from polished 18/0 Stainless Steel. 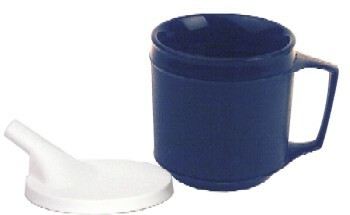 The weighted, insulated mug with lid holds 12 fluid ounces. A steel weight, added internally, gives you a comfortable solid feel that will reduce tremors. The MUG IS NOT MICROWAVABLE! Holder for pens and pencils will securely hold most round or irregular shaped items (1/8" to 7/16") by means of three adjustable set screws. Requires very little pressure when writing if held in an upright position. The steel core is covered in a plastic vinyl handle with groves to fit the fingers comfortably. The weighted holder for Pens is perfect for school, home, or office. With a diameter of 1 1/8" a length of 5 1/4" and weighing in at 7 ounces, this sleek holder will conveniently fit in your pocket, desk drawer, or any personal bag. Also included is an Allen wrench with three extra screws. The Universal Holder, perfect for anything ranging from toothbrushes to facial razors, has three set screws that tighten in a triangular pattern to secure most objects up to a maximum of 1/2" in diameter. Weighs approximately 7 ounces. Shipping weight is 6 lbs. Please shop carefully, this product cannot be returned for hygienic reasons.